Many children consume up to half of their daily calories at school, so it is essential to make sure they have healthy snacks and drinks available, in addition to healthier meals. December marked the fifth anniversary of the passage of the Healthy, Hunger-Free Kids Act. The legislation updated nutrition standards for school meals for the first time in 15 years, and set the first ever national nutrition standards for snacks and drinks sold in school stores, vending machines, and à la carte lines. The “Smart Snacks” standards took effect in the fall of 2014 and research shows they are likely to have a positive impact on students and schools. 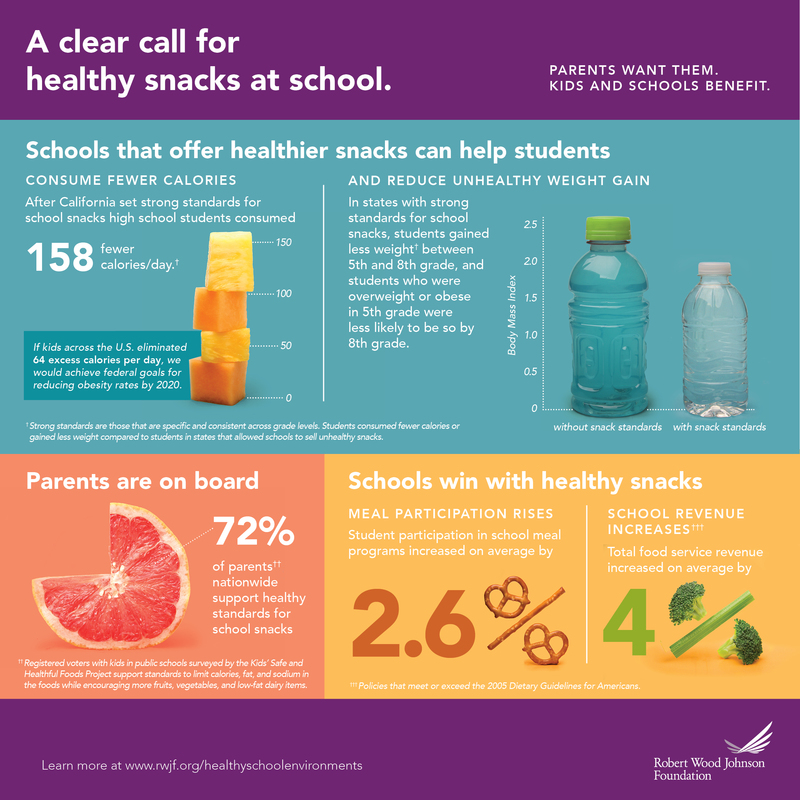 Healthier school snacks can help students consume fewer calories and support school revenue. Plus, it’s what parents want. Many schools were making healthy changes to snacks before the national standards went into effect. Learn more about what some schools were doing through the Healthy Schools Program, and see if your child’s school is part of the program. Our nation's schools have a powerful influence on kids' diets and their health. We need to ensure that all kids—regardless of race, socioeconomic status, or which state they live in—have the opportunity to choose nutritious snacks and drinks throughout the day. Taber DR, Chriqui JF, Chaloupka FJ. Differences in Nutrient Intake Associated With State Laws Regarding Fat, Sugar, and Caloric Content of Competitive Foods. JAMA Pediatrics, Arch Pediatr Adolesc Med. 2012;166(5):452-458. Wang YC, Orleans CT, Gortmaker SL. Reaching the Healthy People Goals for Reducing Childhood Obesity. American Journal of Preventive Medicine. 2012:42(5):437-444. Taber DR, Chriqui JF, Perna FM, et al. Weight Status Among Adolescents in States That Govern Competitive Food Nutrition Content. Pediatrics. Aug., 2012:2011-3353. ††Registered voters with kids in public schools surveyed by the Kids’ Safe and Healthful Foods Project support standards to limit calories, fat, and sodium in the foods while encouraging more fruits, vegetables, and low-fat dairy items. Investing in physical activity, healthy school meals, and other key aspects of healthy schools is critical to building a national Culture of Health.